Click here to download the piece. Artists and musicians are often a neighborhood’s “early adapters.” Drawn by low rents, they move into neglected urban areas and open galleries and cafes. Patrons, tourists and affluent new residents follow. Previously empty streets bustle with commerce; overlooked areas become “cool.” Great for everyone, except of course the artists and other longtime residents who can no longer afford the rents. What’s an artist to do? Well, they’re adapting again. Some creatives are even turning to rural towns. These municipalities often have historic spaces ready to be repurposed as studios, apartments, galleries and musical venues at costs lower than in metropolitan areas. There is also an incentive for these communities to lure artists: The towns get an infusion of energy and a more dynamic economy. The ideal result is a “brain gain” of new ideas and optimism, counteracting the “brain drain” these towns have suffered for decades as younger people move away. Once the artists arrive, they also help a region attract residents and visitors who value cultural amenities. The historic Davis Theatre in Greensboro, PA is being transformed into an artist collective. One such town is Greensboro, Pennsylvania, located on 124 acres along the Monongahela River in southern Greene County. Dubbed “Delight” by the Mingo Indians because of its rich soil, Greensboro once boasted a thriving pottery industry. These days, the town has only a smattering of businesses, most notably the popular Captain’s Watch Inn. But it also has beautiful natural landscapes, a preserved historic district listed on the National Register of Historic Properties, a boat launch providing access to the river, lovely hiking trails, and a weekly summer Farmers’ Market. In addition, it’s home to some visionary residents, including Mayor Keith McManus, himself an accomplished artist and musician. After working for 10 years as a professor at nearby West Virginia University, McManus was disheartened to learn that only two percent of his art students were making a living in the field after graduation. “They lose the space to create and the contact with other artists,” he explains. His goal is to give that spirit of connection back to young people here in Greensboro so they can work together and support themselves through art and music. Six years ago, McManus bought the old Davis Theatre on Greensboro’s main street along with a deserted restaurant and recently closed book store. As a member of the River Town Program, Greensboro was able to obtain a grant to restore the theater’s facade. Meanwhile, work continues on the interior. The building has stood empty since the 1950s, and during renovations McManus uncovered a stamped tin ceiling and a hidden loft in the soon-to-be artist cooperative. Apartments are under construction on the second floor. Other plans include a woodworking shop and bike shop on the first floor, a pottery studio in the back, artist studios in the loft, and room for a gallery in the front. McManus currently lives in the old restaurant which he also uses as a studio. He hopes to find someone to run it as a viable eatery and venue showcasing local musicians like his own bands Stewed Mulligan — with whom he has played for 40 years — and the Red Turtle String Snappers. 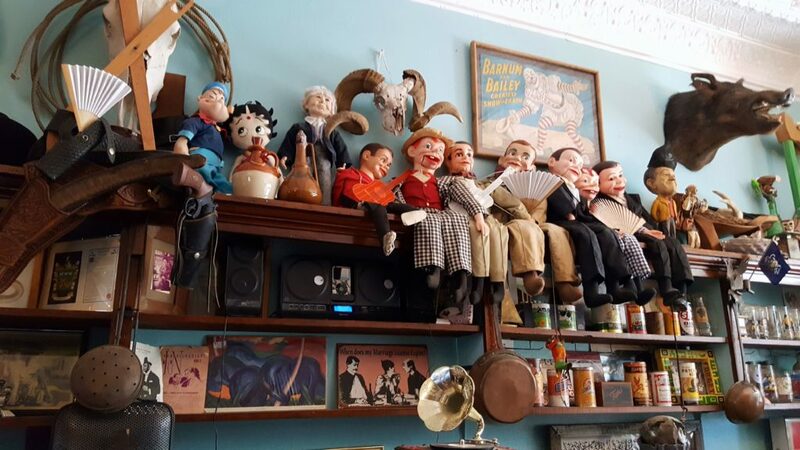 He envisions the bookstore as a coffee and smoothie shop; the space currently houses his eclectic collection of instruments and antiques. Most are for sale. McManus and other local musicians offer guitar, fiddle, banjo and voice lessons there. Keith McManus, mayor of Greensboro, and Dan Levenson, award-winning musician from Pittsburgh. Through the nonprofit Greensboro Arts Cooperative, McManus is on the lookout for other artists, craftspeople and musicians to assist with the rehabilitation. Thanks to his son Shane and a few young recruits, progress is steady but slow. McManus is not deterred. To help lure future tenants, Cathy McCollom of the River Town Program has begun working with Shauna Soom, Executive Director of Touchstone Center for Crafts in Fayette County. Soom took young artists on tours of the communities along the Monongahela River and distributed a survey to gauge their interest in particular areas. Partnering with the River Town Program to find locations for artists to live and work in rural communities fits with Touchstone’s mission of boosting working artists. Greensboro may be just the place for some of these up-and-coming creatives. It certainly is for Mitch Hall, a wood sculptor and musician who currently splits his time between Greensboro and Pittsburgh. For example, Hall learned a lot about doing inlay work from local resident Wyatt Fawley, a sought-after banjo maker. It’s working. 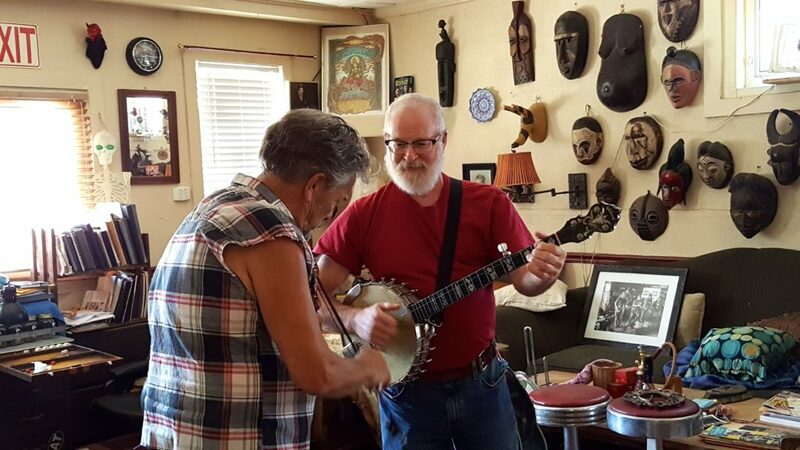 On a recent afternoon, Dan Levenson, an award-winning player of old time music from Pittsburgh, stopped by for a quick impromptu banjo and fiddle concert. A regional sculptor was commissioned to create a visual homage to Greensboro’s past at the town’s entrance. The annual “Art Blast on the Mon” — going into its second decade– is scheduled for September 3 and 4, 2016. Sponsored by Nathanael Greene Community Development Corporation, the two-day festival features art in all mediums, alongside musical entertainment and food. Pablo Picasso said that art washes away from the soul the dust of everyday life. As artists and musicians come to Greensboro, a town built on craftsmanship, they are renewing Greensboro’s soul and washing dust from the heart of the town. WENDY DUCHENE is an attorney with offices in Allegheny and Somerset Counties. She is also an avid user of the many hiking and biking trails in western PA, where she can often be found on her recumbent bike or walking her dog Sander. This story was created in partnership with the Keystone Edge. There is a lot going on in the once sleepy towns along the Monongahela River. Visitors and residents are discovering the myriad opportunities for outdoor recreation and heritage tourism. 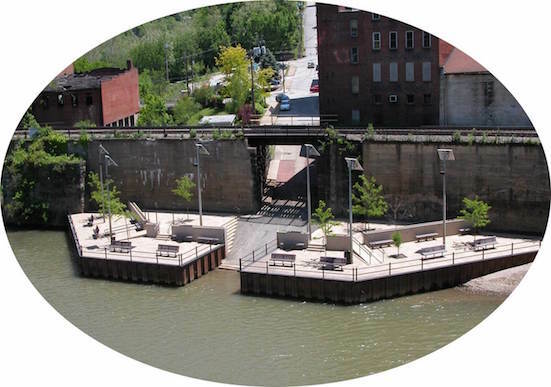 Boat launches and docks, biking and hiking trails are being built and historic sites restored. And Brownsville, one of those historic River Towns, is leading the pack. 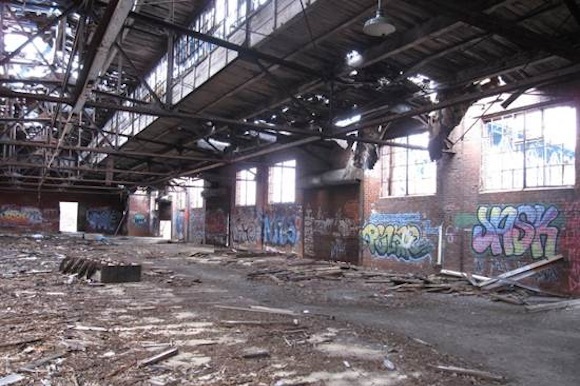 Just 35 miles south of Pittsburgh, Brownsville — founded in 1814 — was once a major player in the nation’s steel industry. And much like Pittsburgh, as the steel and related industries waned, so did the town. Its population, close to 10,000 in 1940, is less than 2,500 today. As citizens moved away, many of Brownsville’s lovely buildings fell into disrepair and its historic downtown into ruin. A number of local properties — Bowman’s Castle, Dunlap’s Creek Bridge, St. Peter’s Church and the Flatiron Building — are listed on the National Register of Historic Places. Brownsville was also one of the first meeting places for the participants in the incendiary Whiskey Rebellion. But this charming hamlet isn’t content to only have a remarkable past — it has a burning desire for an equally remarkable future. And the fuel that lit that fire came from some of this old town’s youngest citizens. In 2011, a group of six Brownsville High School students approached chemistry teacher Kelli Dellarose with concern about the low morale of their community. Dellarose helped the students form a “Students In Action” club, launching what she thought would amount to little more than a standard class civics project. Now, close to five years later, Brownsville’s “Students in Action,” a youth leadership program sponsored by the National Jefferson Awards of Public Service, is much more. The original students and those who have since joined did so to help bring their town back from the brink. The challenge put to them — “How do you want to make yourcommunity better?” — turned the high school civics project into a community-wide, nationally recognized catalyst for the resurgence of Brownsville. Andrew French, head of the Redevelopment Authority of Fayette County, worked with the students as a fiscal agent and attended many planning sessions as they formulated their ideas. For their plan to come to fruition, they needed money, and these students did more than just sell hoagies and hold bake sales. 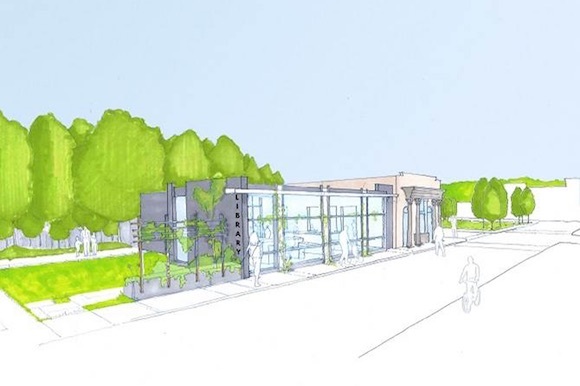 They partnered with local and county government; worked with McMillen Engineering and LaQuatra Bonci Associates, a landscape architectural firm from Pittsburgh, on the design of the stage; and created relationships with major philanthropic agents. And they weren’t the only ones working towards that goal. “The student project coincided with the Redevelopment Authority’s acquisition of more than 20 downtown buildings through eminent domain,” explains French. The park project fit with the plan to demolish some of those buildings to open up the town center and unveil Dunlap’s Creek Bridge, the first all cast iron bridge in the United States. 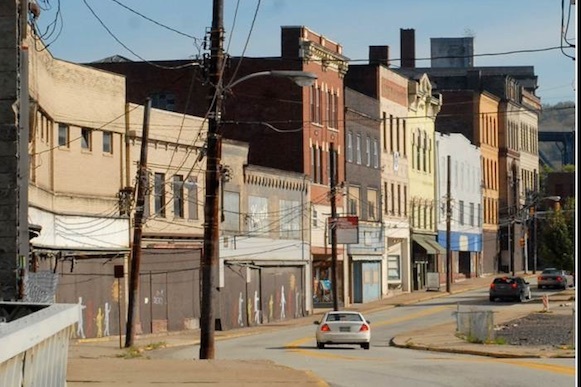 The desire to revitalize Brownsville’s historic downtown got the attention of large funders in Pittsburgh — most notably The Heinz Endowments and UPMC Health Plan. Both contributed generously to the initial planning stages for TREK’s downtown housing project and the student park project. The Redevelopment Authority of Fayette County received a $175,000 state grant for the students’ project. According to French, Brownsville Borough contributed $3,000; $20,000 came from the Laurel Highlands Visitors Bureau‘s Fayette County Tourism Grant. By approaching local businesses and holding fundraisers, the students raised an additional $23,000. In Brownsville, they’re definitely pulling for success. 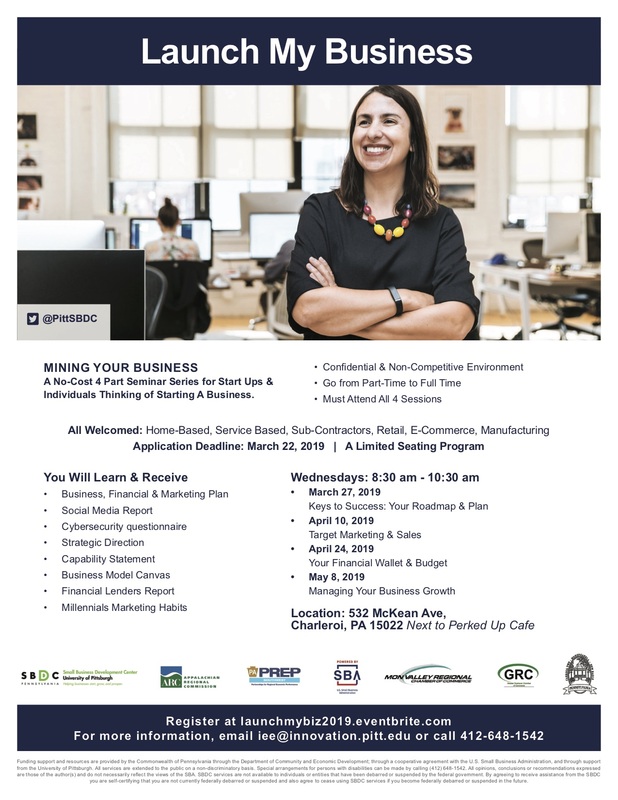 A Brownsville resident herself, Muriel Nuttall, executive director of the Fayette Chamber of Commerce and vice-chair of Brownsville’s Planning Commission, has a real stake in the success of the current projects. She is most excited about how the student work dovetails with other projects in development. Major funders from outside Brownsville saw the combination of housing, retail and outdoor space as exactly what the town needed to sustain itself with new tax revenue. Nuttall agrees. Redevelopment does not come without tough choices. There was debate around preserving historic but dilapidated buildings or demolishing them and starting from scratch. For the area where the National Road passes through town as Market Street — known as “The Neck” — the Planning Commission worked with outside consultants to reach a hybrid decision: save what could be restored and remove less architecturally viable buildings. Though TREK will construct one structure to fill the space on Market Street formerly occupied by a long shuttered G.C. Murphy, the façade will appear as three tall, narrow buildings, mirroring the look of its historical neighbors. Across the street will be the students’ park, providing a gathering place for the new residents, shoppers and visitors. Joe Hackett, principal of LaQuatra Bonci, agrees. The landscape architectural firm was brought in by the Heinz Endowment to work with the students on the design of the park stage. The new design incorporates salvaged trusses from a nearby train station slated for demolition. In the summer of 2013, Hackett was there when the students presented their vision to a group of philanthropic foundations, including Heinz. And that has been noticed way beyond the town’s borders. This year, the Brownsville Students in Action team earned the Jefferson Awards Foundation ranking as the top ambassador team in the nation out of 325 schools in contention. Their Jefferson Award video shows why these incredible students were so successful. Other revitalization and preservation projects in Brownsville are in the planning stages or already approved for funding and implementation. 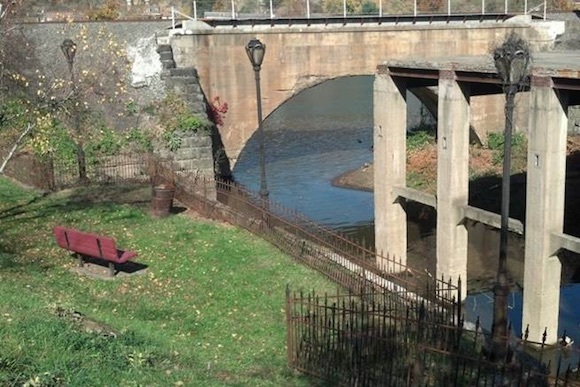 PennDOT has committed to the renovation of Dunlap’s Creek Bridge. 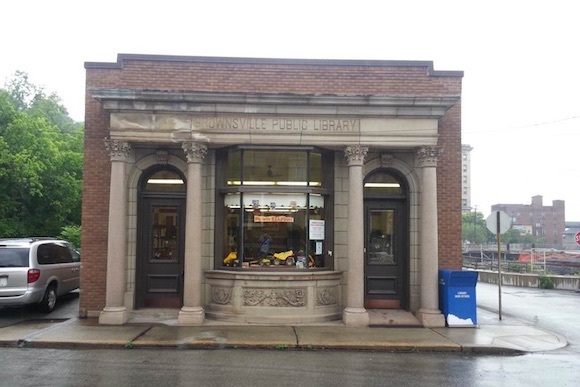 A capital campaign is underway to renovate and expand Brownsville’s library, and resources are being sought to restore Central Park and to design a walking trail bordering Dunlap Creek. 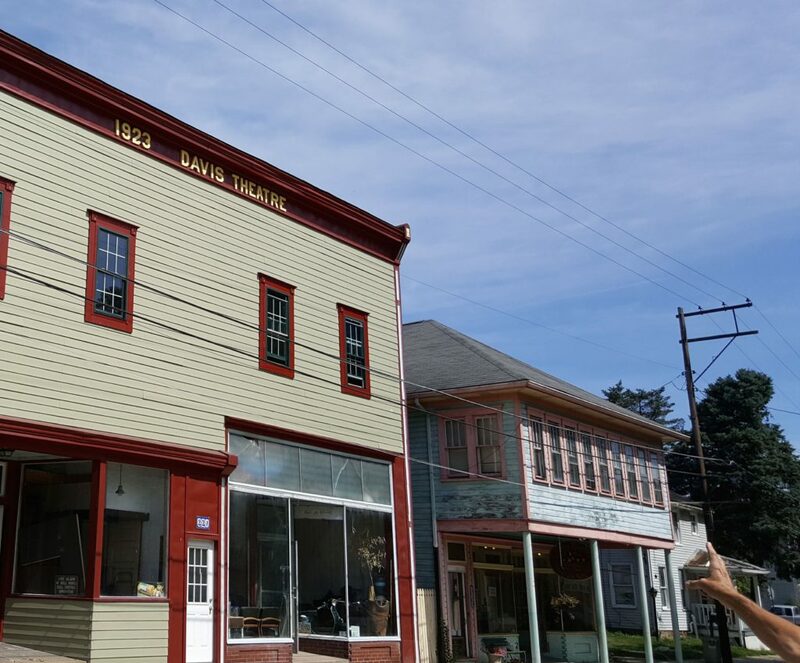 Outside consultants and agencies — The River Town Program and The National Road Heritage Corridor (NRHC) — are also working within the community to continue the progress. As in Pittsburgh, there is talk of a renaissance afoot. Residents, including its youngest, believe in their community, take pride in their town, and want to make sure there is a reason to stay there.